Jane and her students spent a fabulous time on the ocean sewing and designing clothing on this oceanside vacation. Evenyone had a great time, and enjoyed being with the group of women. The willingness of the group to share and help was really wonderful to experience. The meals and lodging at Asilomar were again fabulous. We enjoyed the huge veggie salads that started each evening meal, and the cup of soup that started each lunch. 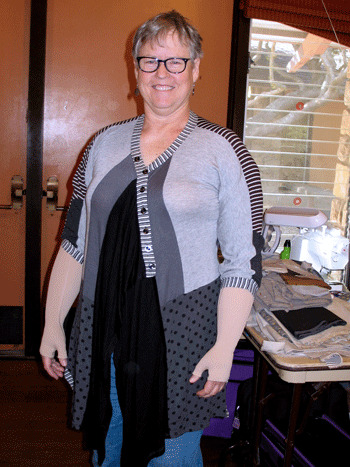 On a recent trip to England, Jane purchased a grey multi-fabric top, and everyone had to try it on. 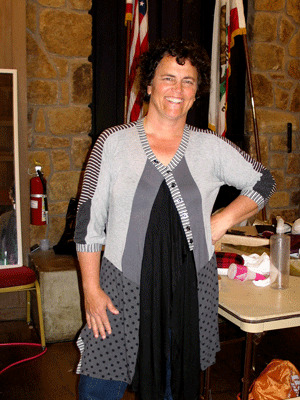 Many different knit fabrics were used in this garment. Jane was showing us how the design could be tweaked with different colors and garment lengths so it would look fabulous on all of us. Soon everyone wanted the group to make a pattern from her top. Some of the women are already going through their stash selecting fabrics for this top. All of the women worked on their own projects. Three or four of them brought their new top of the line Bernina's so Jane could show them how the embrodiery functions worked. They did samples on quilts, pillows, etc. They found this retreat a great way to set aside time to learn their new machines. 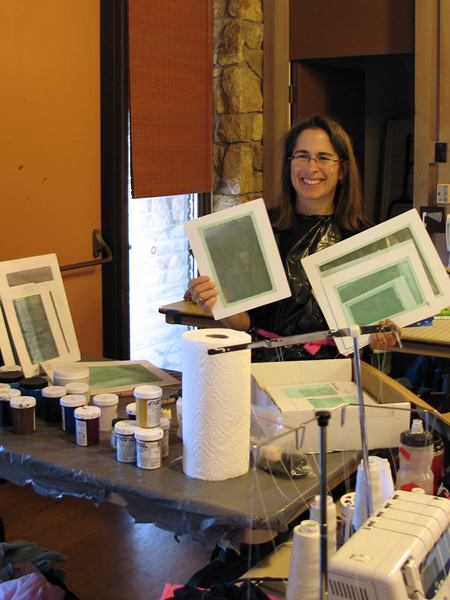 Sally set up her table for an afternoon of stenciling. She stenciled tee shirts she had made and the lining for a jacket. She also got up early in the morning for a run on the beach before breakfast. She enjoyed the opportunity to spend several days doing exactly what she loves and being with friends. 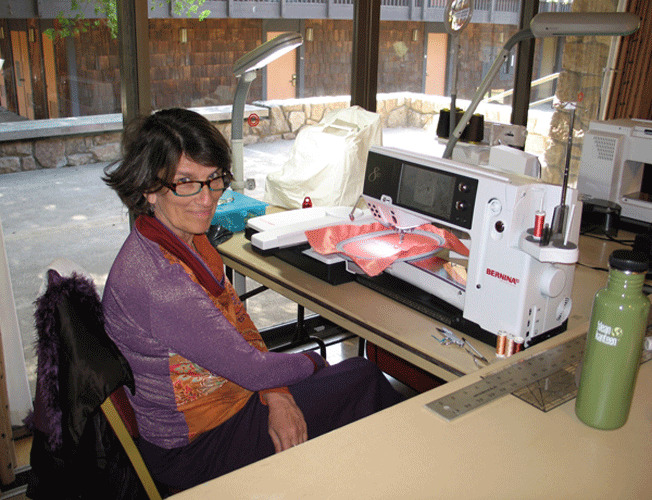 Jane used her expertise in design, construction, and fitting to help everyone with their sewing projects. Her dedication to making sure everyones projects were successful was truly appreciated. Her students are so lucky to have her in their lives. Susie works fast, and had tee shirts, pants, and several other garments fitted. We all enjoyed her humor. 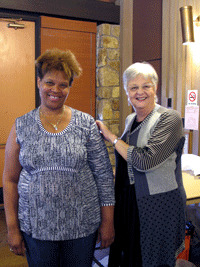 Click here to see a slideshow of some of the garments that were being made, or the quilts that were brought for "Show and Tell".